A somewhat bittersweet edition of Faces of Boundary Bay, as we get to know, and wish a fond farewell to, Ashlie LaLonde. Ashlie was born and raised in the beautiful Adirondack Mountains of New York State. While the area’s natural beauty made a deep and lasting impact on her, the tiny village couldn’t quite contain her boundless enthusiasm, and, after graduating high school a year early, she set out into the world. Ashlie riding with coworker, Shelly in the 12th Man Van for the Bellingham St. Patrick’s Day Parade. She settled into Leadville, Colorado and enrolled into the Natural Resource Management program at Colorado Mountain College. While there she met Ryan Hogue, whom she would meet again, later in life. After her time in Leadville, she moved around a bit and eventually ended up in the Seattle area, where she studied at Earthworks Energy Healing Institute. Not only was this very beneficial to her personally, but it gave her the skills and abilities to help others become more healthy mentally, physically and emotionally, using techniques and processes outside the traditional bounds of modern health care. When the Seattle lifestyle wasn’t quite to her liking, she drifted north to Bellingham, living out in Whatcom County for a while (back to the trees, mountains, and water she grew up with). One day, while lunching here at Boundary Bay (where she distinctly remembers being served by long time team member Pia Fischer) she ran into old friend Ryan Hogue, who was tending bar that day. In a very Bellingham way, one thing led to another, and shortly Ashlie was on our team, where she’s been for almost 12 years now. Ashlie is a woman of many passions, one of the largest being music. She travels quite often to festivals and to see her favorite band, Phish. When she was 12, a friends mom went to get tickets for a Hootie and The Blowfish concert in Lake Placid NY (home to both the 1932 and 1980 winter Olympics). But, it wasn’t exactly Hootie as the tickets ended up being for Phish. Almost the same thing, right? It was the first show for Ashlie, and she has now seen them over 150 times, in all 4 corners of the country. Some of her favorite venues were Red Rocks in Colorado, our own Gorge Amphitheater, Watkins Glen Speedway in the Finger Lakes region of NYS, and in the far northeast corner of Maine. Some of the acts she loves are Ani DiFranco, moe. and The Grateful Dead. She never got the experience of seeing The Dead with Jerry Garcia, but has seen every iteration since his passing. As you would expect for someone with a dozen years in around here, Ashlie has a great many memories of BB. She has always appreciated the team/family aspect of working here, and the way Boundary, both as a company, and as individuals, is always ready to pitch in and help support the people, places, and things that make our community great. She also appreciated all the great folks she’s had the chance to work, and socialize, with. She had a few special shout-outs to former and current team members including Abbey Rose Hastings, Pia Fischer, Samantha Roeder, Ben Glass, and Dane Whitehead. A thing she really misses from the menu is the Halibut Tostada (maybe we can whip one up for old times sake). And, she used to order the Pork Chop with mustard sauce so often the kitchen started calling her Pork Chop. While these days she mostly sticks to a glass of red wine, she does have a few brews she loved while here, including the Imperial IPA, Amber, Cedar Dust, and the recent Gratitude. Burning sage to set the mood four our beer delivery photoshoot! Ashlie is moving on to an exciting new chapter in her life, relocating to Northeast California to be with her love, Jonesey, and start a family. They’ve got some room and they’ll be working together in the alternative medicine field. Ashlie also plans on building a nice workshop for her art works, which she sells all across the country. As a long time Guinea Pig owner, another of Ashlie’s dreams is to open a rescue haven for the little cuties, so that all those adorable critters that might otherwise befall a worse fate, have a safe place. While we are all very happy for these new and exciting developments, we’re also sad that her bubbly, fun, and supportive personality won’t be around regularly. I suspect though (a little unicorn might have mentioned it) that we might see her around the time of Summer Meltdown. Please take a moment to wish Ashlie the best before she flies off, she has certainly made an indelible mark on the history of Boundary Bay. We are more than stoked to have the amazingly talented local artist, Gretchen Leggitt as our featured artist for the month of January! 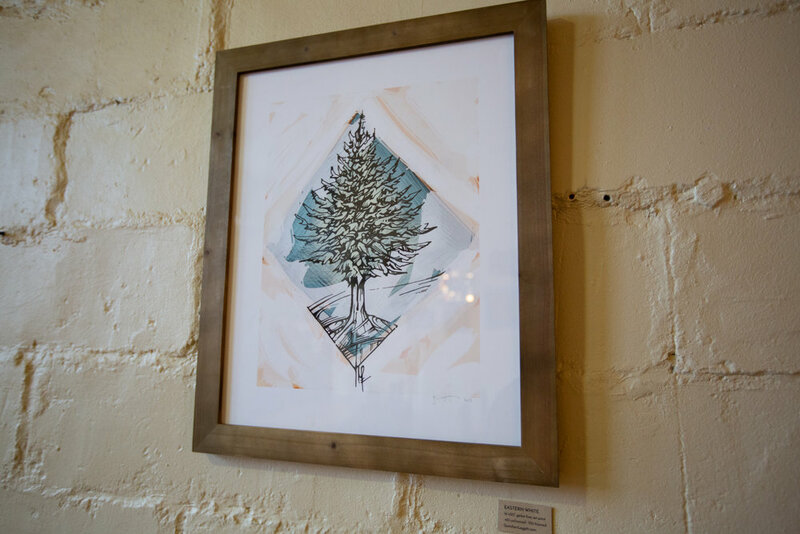 Her outdoor-inspired artwork can be seen all over downtown Bellingham including the Culture Cafe, Hundred North, Mt. Baker Theatre, Vital Climbing Gym and Ciao Thyme. Recently her mural on Cornwall Avenue gained widespread attention as the largest mural in Washington State! We have a collection of pyrography pieces in house outfitting the walls inspired by mountain landscapes from around the world that Gretchen has travelled to as well as local destinations. What is pyrography? Pyrography is the detailed and complicated art of burning designs into wood. As you can imagine, burning pictures and patterns into wood leaves little room for error, adding to the intricacy and complexity of her artwork. Hydrascape stickers are also on display, created by Gretchen with similar mountain landscapes that can be seen in her paintings and pyrography. Made from durable vinyl that is waterproof, UV protected and dishwasher safe, they are designed to wrap around water bottles to create an infinite landscape. These durable stickers also look great on coolers, skis, snowboards, laptops and car windows. Come in to the bistro before the end of January to check out the amazing artwork of Gretchen Leggitt. Pieces on the wall are available for sale (pick up at the end of the month) and stickers in the front are available for immediate purchase. This winter salad is perfect for the holidays and will make you rethink how you feel about leafy greens. The dressing is what sets this salad apart from all the other salads you’ve tried. Made from scratch, this dressing has deep flavor profiles brought out by caramelizing shallots and apples then blending them with a balsamic and sherry reduction. If you try it be sure to let us know what you think and be sure to check out our catering Facebook page for even more recipes! Clean the shallots, peel outer layer, and trim ends. You can soak these in water for a hour or overnight to make peeling much easier. Cut in half if they are larger than a walnut. Wash, core, and cut apple into 1/8ths, leaving peel on. In an oven safe pan (stainless or french steel would be my recommendation) heat the canola oil. Fry shallots until golden brown on all sides but not burnt. Add apples to the pan, and put into oven. Roast until shallots are nicely caramelized, and apples have taken on a nice golden brown hue and are soft. Pour oil, shallots, and apples into a heat safe dish. Deglaze pan with sherry, add that to pan with oil, shallots, and apples. Cool in fridge, uncovered. Cover cranberries with port. Set aside. Once cool, add all ingredients, except olive oil into a food processor or blender. Blend until mostly smooth, then add olive oil in thin steady stream until incorporated and emulsified. In a large mixing bowl, toss spinach with ⅓ cup of dressing. Mix gently with wooden spoons. You can add more or less dressing to suit your tastes. Sprinkle in half of each: candied pecans, port soaked cranberries, and gorgonzola, reserving the rest of each. Mix, and plate. Use the remaining cheese, cranberries, and pecans to top each individual plate of salad. If you don’t like gorgonzola, warm chevre medallions also go excellently! Cheers! Let’s meet another member of the team here at Boundary Bay Brewery, Cliff Goff. Cliff is a Whatcom County native, growing up in the bustling little border town of Blaine. Blaine is also a shore town, with a view of the Boundary Bay that we’re named for. Being close to the water helped spark an interest in the outdoors and wildlife that Cliff carries to today. While in high school, he worked in some of Blaine’s small restaurants, and he found an interest in the kitchen. After graduating he moved to the “big city,” Bellingham. In a non-food related job, Cliff spent a year as a tour guide at Deception Pass State Park. A benefit was being able to keep a daily eye on a family of eagles as the babies grew, and one lucky day while leading a tour, Cliff and his group were able to see the eaglets take their first flight. Another memorable moment was the time a Gray Whale transited the pass, against the tide and current, and made a couple breaches in the process. After that, it was off to Le Cordon Bleu Culinary institute in Seattle to further his chef chops. This led to the chance to cook in the Chianti region of Italy for a few months, and while the experience wasn’t quite what he had hoped, valuable skills were honed. Back home in the PNW, Cliff was in the kitchens of area restaurants including Beach Store Cafe on Lummi Island and the late, lamented Copper Hog. One of the more memorable opportunities he had was working for the Nooksack Tribe. He helped run the food at the Northwoods casino, and was the go-to guy whenever there was an important event for the tribe. Sometimes this could be feeding a large group, or preparing a fine dining experience for Tribal leaders and visiting V.I.P.s. Somewhere in all this, Cliff also spent 2 years creating tasty treats at Chocolate Necessities. While Cliff came on board in the spring of this year, his earliest memory of Boundary Bay happened when he was about six. His Mother and he were in town for the day and came in to eat. Cliff had the Smoked Salmon Pizza, and it was something of a revelation to him, as it was unlike anything he had tried at home, or could find in Blaine. One of the reasons he wound up here with us was the way Jabez Richards, and other coworkers with BB in their background, would speak about it. In the sometimes volatile world of kitchens, everyone Cliff spoke with had great things to say about having worked here. Cliff is filling several spots in the kitchen, working both Hot and Cold sides, as well as his work creating our in-house desserts. He is putting out our seasonal favorite pumpkin pies, and building up new items to go with our existing line-up. Given his background and creativity, there should be plenty of goodies to come. Cliff mentioned though, that if anyone has a suggestion, to please mention it to him. One of the things that really got Cliffs attention once with us was the sheer amount of beer we brew. Although obviously familiar with Boundary Bay beer, he’s now more aware of just how much of our quaffable delights are available. Away from work, in addition to spending time with his girlfriend Brittany, there’s several things that keep his hands busy. He does some homebrewing, and harkening back to his youth, he works with the Marine Wildlife Strandation Network. He’ll get a call to try to help rescue various marine mammals, and, on the occasional call, have to rescue a creature that has fallen to the hands of some our less than upstanding citizens. This can even go so far as to having to save evidence, and pass along remains for forensic research. Overall, this busy guy has a lot going on, but feel free to say hello and to share a beer. The newest limited-release IPA on tap is brewed in appreciation for our country's veterans and will help raise funds for a nonprofit veteran-support organization. Yakima Chief Hops (YCH) created a unique Veteran hop blend to benefit the Semper Fi Fund, a dedicated nonprofit organization. it helps to provide urgently needed resources and support for post 9/11 combat wounded, critically ill and injured members of our United States Armed Forces and their families. Army Veteran and bartender, Sam Stringer helps pour the hops for the Gratitude IPA. Bruce Kale, Boundary Bay’s first employee and Army Veteran, is encouraged by the effort to offer recognition and raise funds for veterans. Kale’s parents also served in the Armed Forces. His father, Glen Kale, served as a drill sergeant in Greensboro, N.C. before shipping off to India during World War II. His mother, Frances Curtis Kale, served in the Navy as a Radio Radar Receiver as well as an Assembly and Repair Airplane Carrier also during WWII. Currently, Kale’s parent’s uniforms are on display at Boundary Bay. Frances Curtis Kale in uniform. In 1942, President Franklin D. Roosevelt signed a bill creating women’s auxiliary agency in the Navy called “Women Accepted for Volunteer Emergency Service” – WAVES for short. Frances Curtis Kale was one of the 283,000 women who joined the military during World War II. “Fate wields an arrow into history for each of us, a nation at war decided for me,” reads a handwritten note from Frances Curtis Kale. “This Veterans Day, we raise a pint of gratitude to thank the men and women who have served our country and hope their sacrifices will always be appreciated,” Lightner says. Other breweries utilizing this blend include: Fort George Brewery, Sunriver Brewing Company, KettleHouse Brewing Company and Postdoc Brewing.